This is by far the best graffiti I have ever seen in this town by a long-shot. The Pirate Fish of course is a symbol of Pastafarianism, also knows as the Church of the Flying Spaghetti Monster. I am honored that my town has been blessed by His Noodly Appendages. There was also another sign that has the symbol of the IPU (Invisible Pink Unicorn). I thought the KGB is now the FSB. Is this an old sign? @ Looney: No, I'm not in Russia. KGB stands for Ketchikan Gateway Borough. I'm not sure how old the sign is, but the elementary school behind it was built in the same year I was born: 1986. 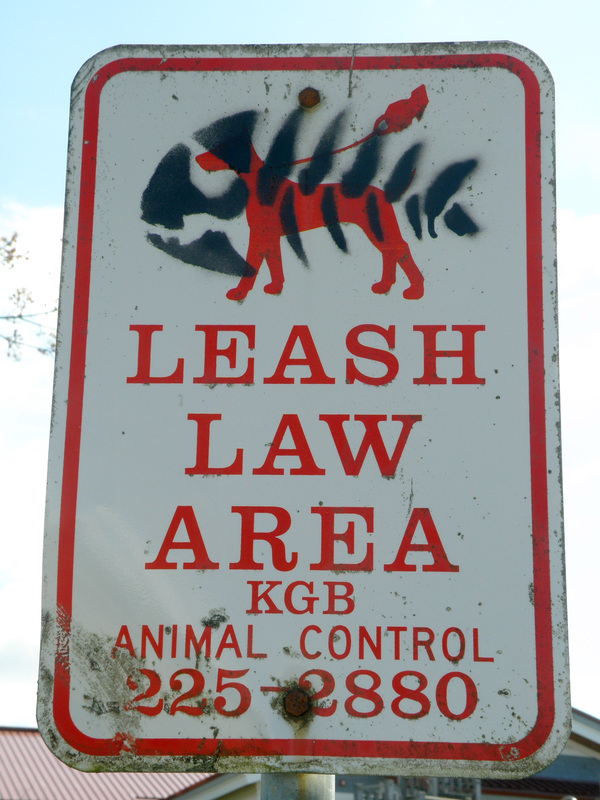 OK, so having the KGB enforcing leash laws isn't as scary as I thought!? @ Looney: lol. No, not quite. In Soviet Russia, even the fish must be on a leash. So That's How Many Savior Stories?